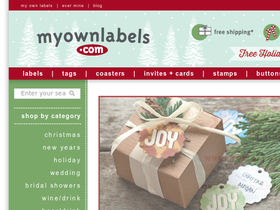 At MyOwnLabels.com you can put your names on elegant custom-designed labels, favor tags and coasters to create beautiful personalized wedding and party favors, food or craft gifts, bath creations, wedding CDs and DVDs, baby announcement CDs and more. Save on your next personalized purchase from MyOwnLabels.com with MyOwnLabels discounts, MyOwnLabels promotions, MyOwnLabels coupons and MyOwnLabels savings from 58Coupons.com. Get your own personalized wedding coasters from MyOwnLabels.com, now just $25 for 24. Click link to start. Visit MyOwnLabels.com to find food and craft hang tags starting at 0.33 cents. Click link now. Now you can create your own beer label on MyOwnLabels.com. Cheers!